The National Association for College Admission Counselling (NACAC) held its national conference in Toronto this past week. On Saturday, the NACAC Assembly debated – and passed with a 152-47 vote – a motion to change the association’s ethical standards to permit the use of commissioned agents in international recruitment. 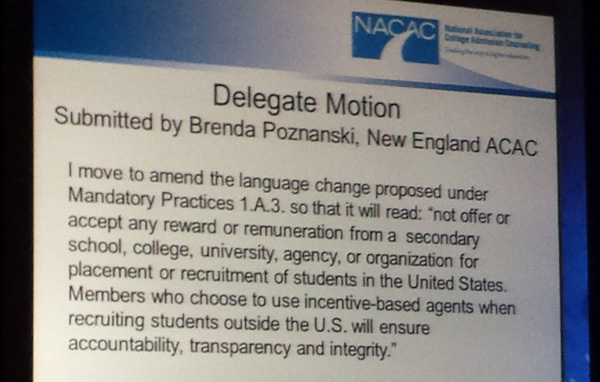 The official motion as presented on the floor of the NACAC Assembly. The question as to whether this stipulation applied to international recruitment – and, in effect, whether it then represented a ban on the use of commissioned agents in recruiting students outside the US – was raised in 2011. This triggered a years-long debate within and around NACAC that led to the formation of the Commission on International Student Recruitment, the Commission’s report earlier this year, and, ultimately, the vote this past weekend on the motion to amend NACAC’s Principles of Good Practice. The new requirements will take effect after a one-year moratorium during which NACAC’s Admission Practices and International Advisory Committees will continue to interpret and refine the implications of the Assembly’s vote for US colleges and universities that recruit students from countries outside the US. It is expected that the Committee’s guide will be presented at the 2014 NACAC Assembly. “The question of whether abusive practices are more likely to happen when agents are paid on a per-student basis has been at the heart of the debate. Some argue that the fact that an agent has a financial interest in a student landing at a particular institution could lead the agent to put his or her own interests – rather than the student’s – first. “There are concerns about a lack of transparency – does a student even know that the agent has a financial stake in the universities he or she recommends – and disagreement about the acceptability of “double-dipping,” in which agents collect fees from both the student and the institution. “Finally, some who oppose the use of agents argue that many universities view them as a shortcut to increasing international enrolments, and tuition revenue, without making the necessary investments to support international students when they actually show up on campus. The American International Recruitment Council (AIRC), a non-profit industry association of accredited US higher education institutions and AIRC-accredited international recruitment agencies, was quick to commend the vote in an official statement over the weekend. “We congratulate the Assembly for its adoption of the motion to amend NACAC’s Statement of Principles of Good Practice. And we particularly support the association’s emphasis on accountability, transparency, and integrity. These values are closely aligned with the standards of practice that we promote at ICEF through our quality control systems, training and certification services, and professional development programmes. This is an exciting moment for our industry, one where we can now move past the question as to whether working with commissioned agents is ethical or not, and on to the more substantive issues that will actually impact on the quality of educator-agent relationships and on the quality of service for students and their families. This entry was posted in Agents, Higher Education, K-12, Most Popular, North America, Regions, United States, Vocational and tagged agent training, language schools, higher education reform, colleges with international students, universities with international students.